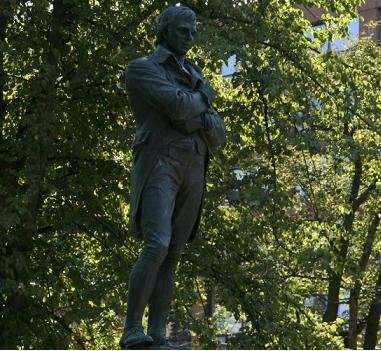 A bronze statue representing the standing figure of Robert Burns with his arms folded. The figure is mounted on a Nova Scotia granite pedestal with bronze plaques embedded on each side. Burns, a man's a man for a that. Robert Burns is a replica of a piece that stands in Ayr, Scotland.